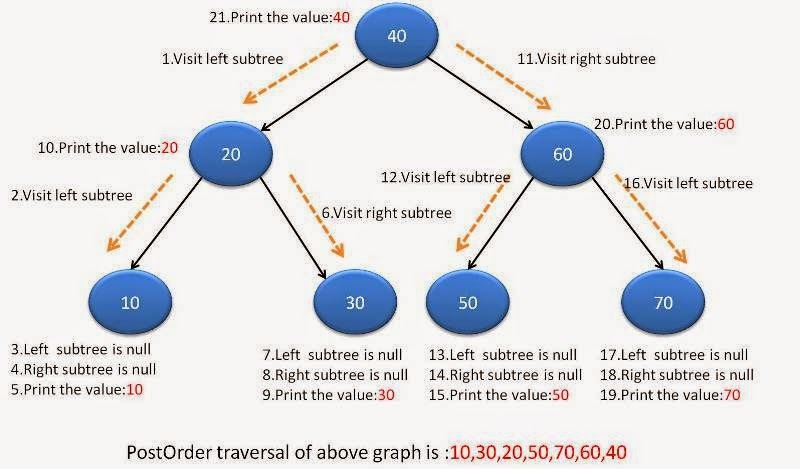 This is 3rd part of java binary tree tutorial. In this post, we will see about PostOrder binary tree traversal in java. In PostOrder traversal, each node is processed after subtrees traversal.In simpler words,Visit left subtree, right subtree and then node. Traverse the left subtree in PostOrder. Traverse the right subtree in PostOrder. Create an empty stack s and set currentNode =root. Push currentNode ‘s right child and then currentNode to stack. If the popped node has a right child and the right child is at top of stack, then remove the right child from stack, push the current node back and set currentNode as currentNode ‘s right child. Else print currentNode ‘s data and set currentNode as NULL. Repeat steps 2 and 3 while stack is not empty. What happens when the last left node does not have any children?